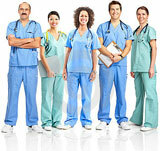 Different kinds of Medical Doctors and what they do? The world is Mother Nature's marvel that is blessed with different wonders of the natural world like the human body system. But, with every blessing comes some kind of curse and this curse that plagues the living world is called as disease. There are different kinds of diseases and disorders that are either due to microorganisms, parasites, non-functioning of different organs in the body, biochemical imbalances, genetic or hereditary problems, etc. Many times, people suffer from different kinds of accidents natural ailments like colds, flu or bacterial infection and man-made, wounds, burns and many other innovative types of grievous injuries. These different medical problems are taken care of by different types of doctors and what they do, according to their field of specialization and the list goes on as medical science progresses through the years coupled with new technologies that allow much more detailed and focused diagnosis of human diseases. In the age of information and with then wonders brought about by the internet, other specialist doctors even operate their patients from far afar with the use of robots. There are hundreds of examples around the world, where doctors have been able to pull men out of the jaws of death with their medical expertise. Doctors, also called physicians, have an effect on everyone's life. Being a doctor is the most respectable and demanding profession. Doctors are responsible for saving lives, assisting newborns to come into this world as well as giving hope and treatment to the sick. There are quite a number of doctors in the world today. However, all these doctors have a common goal to make our lives better by providing treatment and preventing us from contacting diseases though provision of vaccines. If you want to face different medical challenges, then the following list of different kinds of medical doctors and what they do, will help you find a foothold in the medical world. Andrologists: An andrologist is a medical doctor or licensed physician who provides diagnostic and treatment services to men with reproductive health issues. These professionals help patients who have hormonal disorders, fertility issues, and erectile dysfunction, among other problems. They conduct physical examinations, prescribe medications, and suggest lifestyle changes to help patients overcome and manage their disorders and problems. Many andrologists also perform routine surgical procedures, including vasectomies. Epidemiologists: Epidemiologist are the doctors who are also known as 'disease detectives'. They carry out study of diseases and come up with ways of prevention of diseases through vaccinations, etc. Family Practician: These are your friendly neighborhood doctors who are basically general physicians, and treat patients of all ages and medical non-emergency conditions usually in a clinic. Neurologist: These are doctors who treat one of the most delicate and important organs of the body, the brain. They treat conditions like seizures, strokes, Parkinson's, Alzheimer's, etc. Pathologists: The study of abnormalities in living organisms, diagnosing diseases and conditions from tissue samples like blood or biopsy samples. They also work as medical examiners & carry out autopsies to determine the cause of death. These doctors usually do not come in contact with the patients directly as their work is mostly lab work. They are therefore called as a 'doctor's doctor' as they speak to doctors of the patients rather than the patient himself. There are many doctors who specialize in forensic pathology and help the police and FBI solve crimes. Surgeons: A surgeon performs operations, related to different sub-specialties of medicine like general surgery, neurosurgery, cardiovascular, cardiothoracic surgery, ENT, maxillo- facial surgery, plastic surgery, oral surgery, transplant surgery, urology, etc.